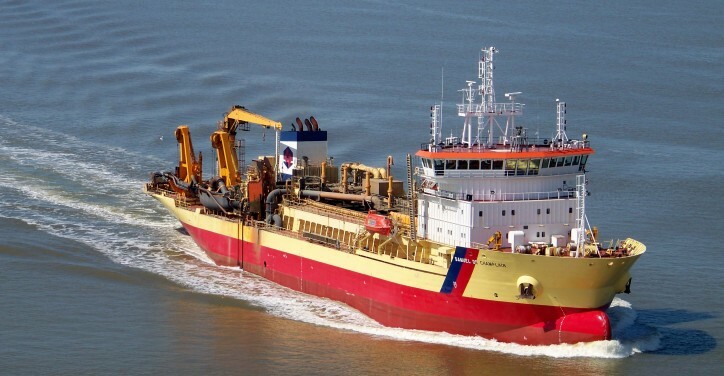 Electrical system integrator Alewijnse Marine has entered a new phase in the electrical conversion of the ground-breaking, low-emissions dredger TSHD Samuel de Champlain. After months of engineering and a study of the potential harmonics pollution in preparation for the electrical conversion, the company has started work on board the vessel at Damen Shiprepair Dunkerque, where the ship arrived in October. Samuel de Champlain is being converted from diesel-electric propulsion burning MGO to dual-fuel capability combining LNG and MGO, and this will be the first conversion of its kind to take place on a dredger in Europe. The vessel is a 117-metres long, 8,500m³ trailing suction hopper dredger owned by GIE Dragages-Ports, based in Saint-Nazaire, France and operated by the port of Nantes-Saint-Nazaire. The works will include the installation of two LNG tanks on the hopper deck and the replacement of the three existing diesel generator sets, two main and one auxiliary, with three dual-fuel generator sets. At the same time, the electrical distribution, command & control and security systems will all be upgraded. The machinery spaces, the cooling systems and various piping will also require extensive modifications. The works on board started in October and are expected to take about one hundred days. To complete the project within this limited period, the Alewijnse project team is operating a system of shifts. The Alewijnse team has already begun dismantling and removing the old equipment and cabling. With that completed it will move on to upgrading the power management system (PMS) and the alarm and monitoring system (IAS), replacing the fire alarm system, and then undertaking the cabling, connection and testing of cables for the new equipment. In addition, Alewijnse will provide and install ATEX lighting in the gas zones, an upgrade of the CCTV system, a new gas detection system and new soft starters for the jet pumps (550 kW/6.6 kV each) and bow thruster (900 kW/ 6.6kV). With the contract for the Samuel de Champlain, Alewijnse has reinforced its already strong position in the LNG and dual-fuel installation market. Earlier this year, the company supplied the complete electrical outfitting for the ground-breaking Bodewes LNG tanker BN803 Coralius, the first purpose-built LNG bunker and feeder vessel to be built in Europe.